So you’ve gotten into the rhythm of blogging. That’s great! However, since you’re still new in the scene, chances are you’re unaware of things that may irk your viewers. This blog post today will shed light on mistakes I’ve made in the past – things that not only irked my viewers but fellow bloggers too. Don’t be that newbie! 1. Posting too much content. Please, spread your blog posts out – on your actual blog and wherever you are promoting it. You invest so much time and effort into your content, don’t sell yourself short by oversaturating people with your work. Take the time to strategically schedule your posts. There is nothing worse than scrolling down your Twitter timeline only to be bombarded by a million tweets from the same person. Not only does make a person look like they’re rapid-fire tweeting, but chances are viewers won’t take the time to click on each link in each tweet. Likewise, I see new bloggers post five Instagram pictures within 10 minutes. Unless you’re Beyonce, this hardly proves to be successful. Think small doses. Less can be more. Sometimes using too many hashtags can look like a desperate call for attention. If you’re posting a picture of your family, don’t hashtag things such as: “#family,” “#love,” “#perfect,” “#goodlooking,” “#wearecute,” or other generic words and phrases. Yes, findability is key, but be strategic with your hashtags and use them at the right time. Hashtagging is great when it comes to marketing, but use niche hashtags or even tag/mention brand names. However, if you’re posting a picture where hashtags are unnecessary, don’t include them. Also, when it comes to platforms, “to each their own.” For example, hashtagging on Facebook really isn’t as effective as on Instagram, and hashtagging specific events are great on Twitter for live tweeting (e.g., #sxsw2015 for South by Southwest 2015). 3. Starting tweets with “@” when your intent was to share with your followers. 4. Asking to follow back. Publicly asking someone to follow you back is like giving someone a gift during Christmas and expecting to receive one back. People will follow your account if they’re interested in your content. Everyone has different tastes and preferences on social media – and maybe what you put out there is not exactly what they’re interested in. Trust in your content, and you will gain your following. Also, constantly asking people to follow you back on social media makes one look desperate. 5. Keeping your social media accounts private. If your goal is to grow your blog, you can’t keep your social media accounts private. I see many bloggers with private Instagram accounts and still hashtag on their pictures. If your account is private, people can’t find your pictures under that certain hashtag. Furthermore, if your Twitter account is private, influencers you tweet at can’t view your tweets, and therefore can never retweet your tweets to their followers. Really decide on what you’re going for – is it a popular blog, or a personal diary? 6. Calling to action, with no call-to-action option. You want people to view your video, your blog post, etc. However, you don’t leave them with an easy option to do so. When you promote your content, you want to make it as easy as possible for someone to view your work or even share it. For example, bloggers on Instagram copy and paste their URL to their blog entry into their caption. URLS in Instagram captions are not clickable. Your viewers will not take the time to memorize the URL and input it into their browser. You must instead direct them to a link in your bio. This way, they can just click on your profile page and click away. Another example: You post a video on Facebook promoting your brand’s apparel. You promote how awesome the brand is through amazing video content, however you don’t leave a link to where they can purchase the brand. Leave a link to the shop in the same post. This way, if someone’s interested, it takes little to no effort to proceed to checkout. 7. Posting the same exact message everywhere. You have several social media platforms, some with overlapping viewers. Try to mix things up between each channel. There are so many different things you can do within each channel. Don’t post the same exact message in each one. For example, on Instagram you can post 15-second behind-the-scenes video clips. On Facebook, you can post links to related creative content, or even full YouTube videos. On Twitter, you can retweet what influencers are saying about your brand. The possibilities are endless. You have different functions and different types of audiences within each platform. Be creative. 8. Sounding like a promoter. Yes, it’s great to promote your content across your platforms, but don’t sound like a promoter. Try to promote your work as naturally as possible. Instead of telling people to click, share, view, etc., ask them questions. For example, “What would you do if wild animals kept breaking into your garden and eating all your vegetables? I had this problem and made this. More info on my blog.” Doesn’t this sound a lot better than, “Check out this thing I made on my blog. 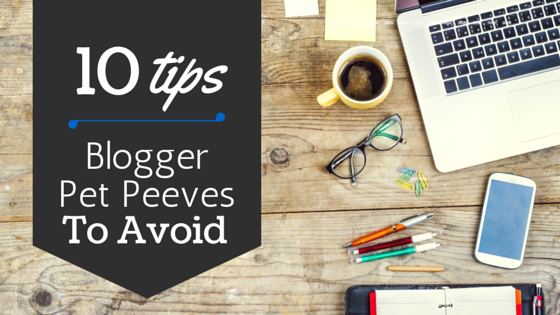 Click, click, click away!” The part of social media bloggers overlook is the “social” aspect. Be as conversational as possible! Don’t forget to respond to comments as well. This does not even need an explanation. What are pop-up ads to me? Well imagine you are trying to catch a train, but the ticket machine is taking too long, there are people in your way, or the elevator isn’t working. Yes, I get a similar feeling whenever I run into pop-up ads. The only difference is with websites I have the option to leave, whereas with the train, I still have to wait for it. 10. Not Organizing Your Blog. Sometimes I run into blogs I have no idea how to navigate around. If you haven’t done so yet, I highly recommend categorizing your blog posts. Then, create a menu at the top of your blog linking to each category. This way, if someone’s interested in one aspect of your blog, they can easily be directed to all blog posts that are similar – e.g., food, travel, culture, etc. Don’t mindlessly blog without thinking of categories first. Categories can also make scheduling your blog posts easier! You can designate certain days to writing about a specific category, which can in turn help with blog ideas too.